A customer from Indonesia placed an order for XCMG XGC16000 (1250 t) crawler cranes, and planned to put them into an ocean engineering. XCMG has become the first Chinese business to achieve kiloton crawler crane export. It is worth mentioning that XCMG is rewriting the structure of domestic crawler crane market with a market share of over 80% in terms of kiloton crawler cranes. Relying on the R&D and manufacturing experience in crawler cranes for more than ten years, XCMG has been in a leading position in this field. From the launch of QUY150 (China’s first hundred tonnage crane with proprietary intellectual property right) in 1998 to the rollout of “China’s largest” 300 t crawler crane in 2003 to the successful launch and numerous practical tests of XCMG 1000 t, 2000 t, and 4000 t crawler cranes. The XCMG crawler crane has been setting many new records in the industry. XCMG has 50-4000-tonage series products for wordwide clients, and also it is committed to provide more use values for customers and opening a new generation technology research. 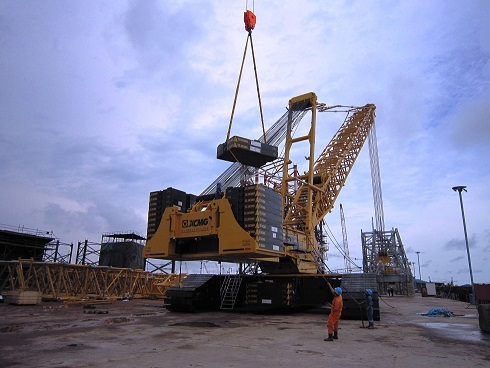 This time the XGC16000 crawler crane exported to the Southeast Asia outshines other “competitors” for its high cost performance, top quality and strong technical strength. The customer, having compared XCMG product with products from other suppliers, concluded that the XCMG product would technically satisfy requirements of hoisting offshore drilling platform equipment, its hoisting performance was better than other products of the industry, and its cost performance was better than other domestic and foreign brands. The successful export of XGC16000 crawler crane is of strategic significance to XCMG. It marks a further step of XCMG to the international market relying on its brand, service and technology. It shows that XCMG has successfully responded to demands from different countries, regions, and customers, and that XCMG has closely integrated innovation and design into its large mobile cranes.